I made this all the time. It is so quick, yummy, and healthy. This and the Sautéed Garlicky Kale are by far the most common veggie dishes served at my house, followed closely by my Cabbage Slaw. Set up steamer basket over water and turn on stove to medium. Wash and cut 1 broccoli crown into big bite-sized pieces. You can peel the stem and slice it up thinly. Put on steamer basket and cover with a lid. Let boil (you can turn it down to medium-low when it gets to a rolling boil) for about 5 minutes or until the middle is getting soft when you poke it with a sharp knife. 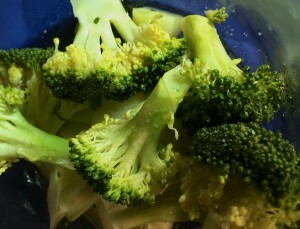 This is the key point – make it soft enough that you are not eating mostly raw broccoli, but do not steam it to broccoli mush. Dump it all onto a plate and drizzle with some nice olive oil (I love Saratoga Olive Oil Company on Church Street in Burlington – their Myer Lemon Olive Oil is to die for) and sprinkle with sea salt. Maybe your friends will ask you why your broccoli is so darn good, too. PS Sometimes I get it all set up without turning the stove on before I start on other dishes and then turn it on about 10 minutes before I want to serve dinner. This entry was posted in Recipes, Side dishes and tagged greens. Bookmark the permalink. Both comments and trackbacks are currently closed.